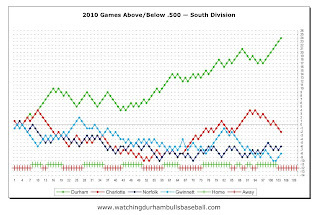 Seven wins in a row; twenty-four games above .500, the best won-loss ratio in a couple of years; thirteen games ahead of Charlotte in the South Division of the International League. 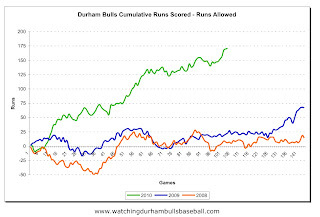 After a few problems just after the break, the Bulls are more than back on track. Up in Pennsylvania we’ve had a couple of interesting games. In both the starting pitchers, Heath Phillips and Brian Baker, had above-average starts, but ended with no-decisions. In both Winston Abreu came on in the 9th and struck out the side. In the first game Lehigh Valley did what it could to avoid Dan Johnson and it was modestly successful. They walked him twice and he was held to “only” one single. In the meantime they may have lost track of other power hitters on the Bulls. In the 9th, Justin Ruggiano came to bat with runners on first and third, one out, and the Bulls behind by one run. You have to pitch for the double-play because Dan Johnson is up next. Showing signs of the Ruggiano of 2007 and 2008, Justin put it over the wall. In the second game the Iron Pigs sort of pitched to Dan. He singled in the 2nd, but was caught in a double play. He singled in the 4th, but was again out on a double play. In the 6th, with Elliot Johnson on third base, he grounded out and got his 92nd(!) RBI. He led off in the top of the 8th and drew a walk. Fernando Perez came in to run for him and promptly stole second base. The next batter, Chris Richard was walked. Joe Dillon got a bunt single, so the bases were loaded for Dioner Navarro, who drew a bases-loaded walk for the tying run. The next batter, Furmaniak, hit into a double play, but the go-ahead run scored. Speaking of Furmaniak, he hit into two bases-loaded double plays yesterday. I don’t know how you work on your “situational hitting”, but his needs some work. A couple of charts. Click on the chart for a larger version. Since the last time, the Bulls keep on improving. 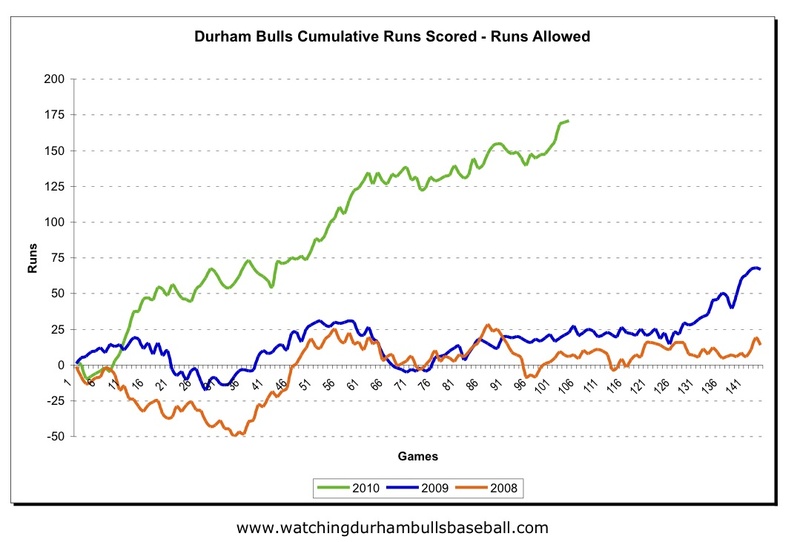 And the runs scored/runs allowed chart is simply spectacular. 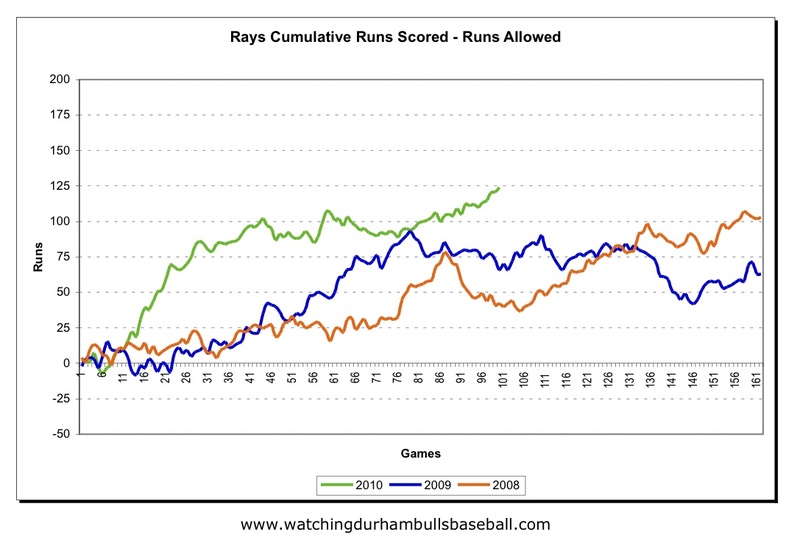 Meanwhile, down between the Bay and Clearwater, Florida, the Rays are having a so-so season, and a fair-to-middling runs scored/runs against numbers. Note that Baltimore is doing so awful I’ve taken them off the chart. It was screwing up my scale. 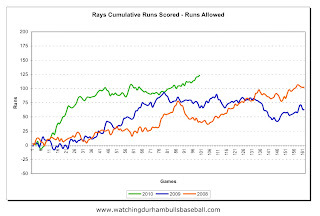 Given how the Rays are doing, you’ve got to wonder why there are any trade rumors at all. What’s to fix? Not sure if you're being serious about the Rays? 2nd best record in baseball is hardly a middling year. They really could use Dan J though. 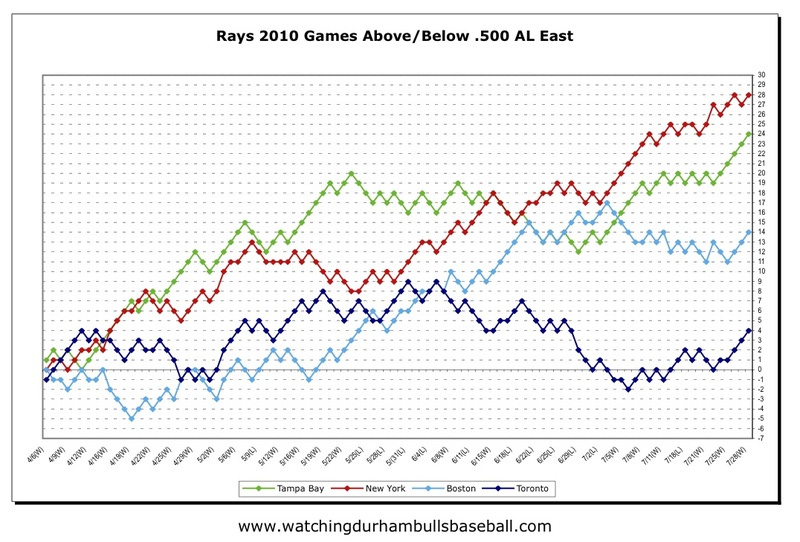 Especially given the division they play in and their budget, the Rays are having a spectacular year. 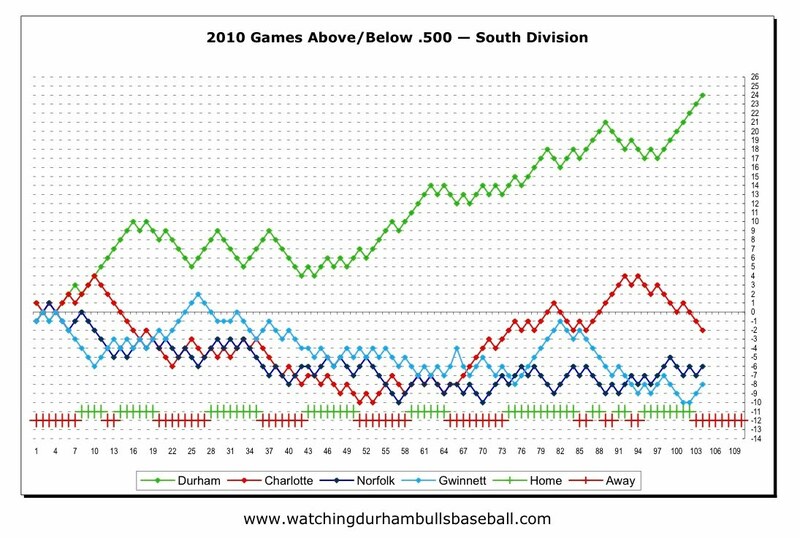 Sure there are weaknesses in starting pitching (Davis and Shields), sure they could do with better hitting (everyone), but they are winning games against good teams. 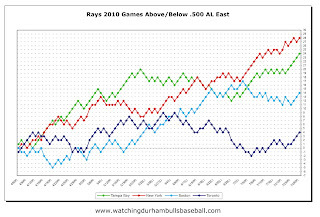 Also, the second chart shows how much better they are than their best year. So if they are smart about September callups they should be in good shape.